I spend almost all my time attempting to figure out how I can braid storytelling and organizing. 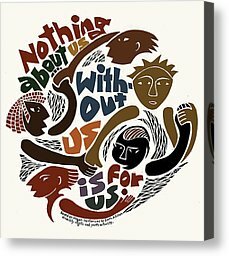 I’ve been attempting to not just organize communities around ideas, but also organize ideas, making sense of the din around us, the tunnel vision that too often exists in the justice world, the lack of recognition of the ties that bind injustice together, and the ways and whys we too often ignore who we are for what we do. I’ve often used this quote, “If you’re not at the table, you’re on the menu,” but it’s never seemed more apt to me than it has in the last few weeks. Because I have never considered myself an artist, and because the food justice world is the one I intentionally live in, reporting on CREATE: the Community Meal became more than just a story assignment I asked for. It really became one I needed to write and one, for lack of a better phrase, I felt called to write. So too did a story I recently wrote about a rally held by Somali women for a community-based food shelf. Here’s the deal. I believe that storytelling is the single most important thing we can do, not just as a tool in our arsenal, but in our declaration of of self. Too often I am told, stories don’t matter if nobody hears that, but I disagree. As someone who has been told to “tone it down” or “get out of the way,” as someone in communities always told the same things, we begin to hold that silence around us like some sort of safety blanket. Maybe, if we don’t make noise, we’ll be safe and we can live our life and no one needs to know we’re here. I know differently and I disagree. Sometimes, the act of saying anything, even if just to ourselves, instead of shutting down is the most powerful act any person could do. Sometimes the act of announcing who we are to our own self is all we need to declare a space at the proverbial table. I spoke with a young man and his children at CREATE: the Community Meal. They lived near the neighborhood. He was out of a job and struggling not just to make ends meet, but to make sure his kids were eating healthily. His story didn’t have to reach everyone to change him, for him to feel more powerful for speaking up, for his voice to not hold me accountable to my own promises, he just had to say it, even just to himself. That’s what mattered. CREATE mattered, because 2000 people gathered for a meal, on a windy day in St. Paul, just west of the Capitol and its opulence, east of the University of Minnesota and its massive-ness. 2000 people, too many of whom would not have had a healthy meal that day, gathered to have a meal together, in a neighborhood too often only recognized by its crime rate and a lack of so-called community investment. 2000 people gathered, and they didn’t have to say anything, to change the frame used to talk about Frogtown. CREATE was important, because it is so easy to deny, despite every fact, that marginalized communities face food injustice. CREATE made those stories and those faces obvious, binding those people and their stories together eternally. CREATE also made the solution obvious in its food, in its art, and in all that it was. 2000 people sat a 1/2-mile long table and they set the new agenda for what food justice will look like in Frogtown. The day after CREATE: the Community Meal, I reported on a rally held by Isuroon, a Somali women’s organization, who have been organizing for a healthy, halal, community-based food shelf. They also met with Commissioner Peter McLaughlin. Now, I don’t know how to explain this, but to say about 40-50 Somali women, mostly elderly, gathered at the Hennepin County Government Center, absolutely terrified and completely nervous, but with one intent: being able to feed themselves, their family, and their communities. Can you imagine the strength it took for those women to stand up and claim their right to eat, even just to themselves? 50 Somali women sat at the table in Commission McLaughlin’s office, at their kitchen table, at their desk and they decided they would fight for a new way of looking at food and food justice in their community. I know that writing both the articles about CREATE and about Isuroon were two of the greatest writing struggles I have ever had, I also know other food justice stories I will write will mean the same struggle. Writing these sorts of stories, developing new ways to talk about the world we live in, and doing so as a storyteller in a variety of capacities, this is a struggle, but it should be something we struggle with. We’re dealing with some incredible injustice, and we’re dealing with some incredible work for justice, and these shouldn’t be easy to talk about, nor should they be easy to write about. These things shouldn’t be easy to write about, because the stories said aren’t easy to say. We should struggle with our words, because the mere act of speaking, layers another brick in the foundation of a better world. I wrote both these articles for the TC Daily Planet (where I serve as both a Board Member and volunteer Community Engagement Editor). I really struggled with writing both articles, because they mattered to me. I’m hope you have the opportunity to struggle with your art. A note: my blog was recently syndicated at the Twin Cities Daily Planet. I’ll be blogging on a weekly basis for them through this platform. I’m super excited to be moving forward with them on this. You can also find both articles linked here: A Frogtown feast: Thousands gather to discuss food access in St. Paul and South Minneapolis Somali community asks for ethnic, healthy food shelf. Credit to Ricardo Levins Morales on the art piece above. I heard him speak at a convening this week and I found what he said to be incredibly moving and transformative. This entry was posted in Uncategorized and tagged CREATE, Food Justice, Isuroon on September 30, 2014 by cisaadeh.